This page is in development. For a full list, including differences between various synagogues and places, see annex. There is a special melody for לכה דודי for שבת חזון (discussion & recording). Note: the recording has the couplets לכה דודי and זכור ושמור and התעוררי. Couplets 1-4 & 9 are similar to זכור ושמור. Couplets 5 t/m 8 are sung on the melody of התעוררי, the melody of אלי ציון. Last words of the קדיש before the עמידה Friday night and before מוסף: on the melody of Rosh Hsahana (done not done on shabbat Shuba). On the shabbat before the first סליחות: reciting of הכל יודוך (one line chazzan, one line tsibur) stops. During the selichot, one chazzan is appointed for ma'ariv in the evening, selichot, shacharit and mincha the following day. For the next 'roud' another chazzan may be appointed. An aveel can be chazzan only if he takes all services, including the selichot. Shofar blowing, as done in Amsterdam plus recording of the single 4 tones. 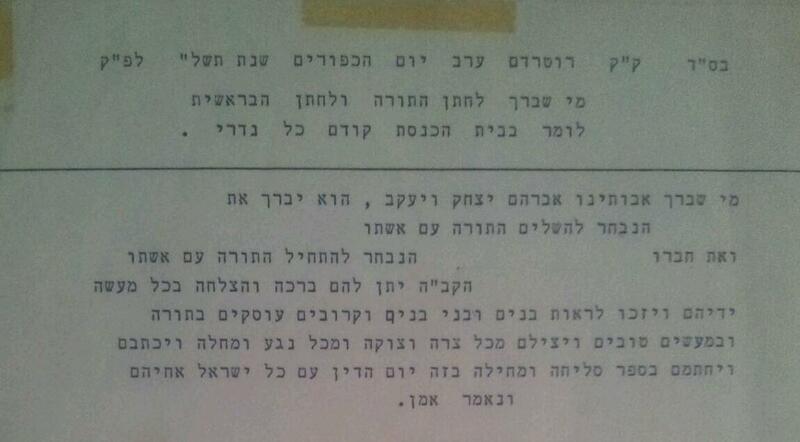 In Amsterdam, on the the first day on Succot the cazzan recites the מי שברך לחתנים after the Tora reading, if they are known. In Rotterdam, this is recited on כל נדרי, before בישיבה של מעלה, with a different text.